This German Hotchkiss 105mm le.FH 18 (Sf.) 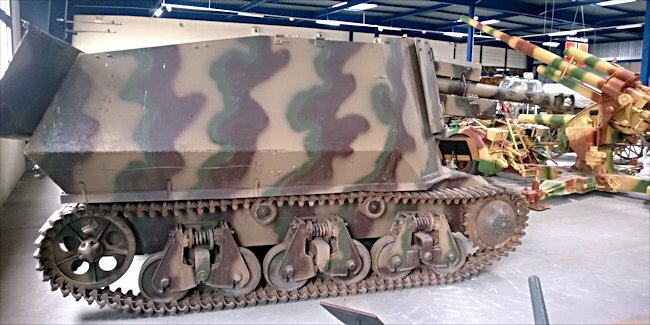 auf Geschutzwagen 39H(f) Self propelled Gun can be found at the French Tank Museum in Saumur in the Loire Valley. Between 1942 and 1943, 48 Hotchkiss H-39 tanks were converted to artillery platforms. These vehicles mounted 10.5cm howitzers. Most of these conversions used the leFH 18 howitzer, but a few were converted using the leFH 16 howitzers. After World War Two this SPG was kept at AMX tank factory in Satory, France and then moved to the museum in 1968. The French Tank Museum is in Saumur in the Loire Valley. The Museum is called Musée des Blindés ou Association des Amis du Musée des Blindés. Its address is 1043, route de Fontevraud, 49400 Saumur, France. The museum's website is www.museedesblindes.fr. The word Blindés means armoured. A train from Paris Montparnasse Railway station to Saumur only takes two hours. It was powered by a 6-cylinder 86 x 100 3485 cc engine that produced 120hp. It had a top road speed of 35km/h (21 mph)and an operational range of around 129 km (80 miles)It had a 5 man crew and only 34mm thick armour at the front of the vehicle which would only just about stop a bullet. It was armed with a 105m leFH 180 howitzer. The letters 'LeFH' are not French. They stand for 'leichte Feldhaubitze' which translates to 'Light Field Howitzer'. It fired 14.81 kg (32.7 lb) high explosive HE shells and in an emergency 14.25 kg (31.4 lb) armour piercing AP rounds. Its maximum firing range was 10,675m - 10.67 km (11,675 yards - 6.63 miles). A MG 34 machine gun was attached to top right side of the armor casement, on a swivel mount. Spare ammunition 50 round drums were stored underneath the mount. It fired 7.96 mm (0.31 in) bullets. 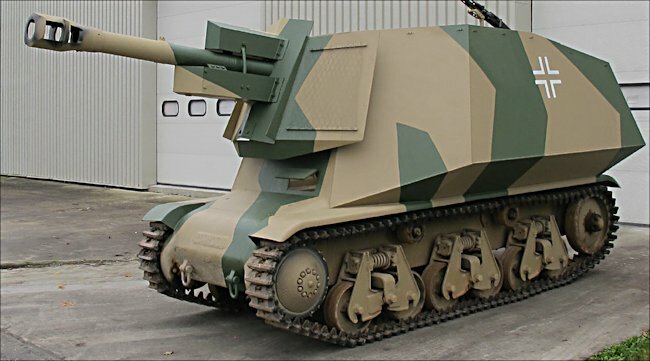 The development of the German mobile armoured artillery led to many adaptations on obsolete tank chassis, usually resulting in an overloaded chassis and very low power to weight ratio, such as for the self propelled 105mm light howitzer model 18 on the Hotchkiss H39 chassis. It featured an open topped and lightly armoured fighting compartment. Only 48 of these machines were produced between 1943 and 1944. It was built to the same specifications as the Sd. Kfz. 135 Lorraine Schlepper, but were fitted with an armored superstructure of greater thickness. The leFH 18 and the Panzerjager conversion were unusual, in that the engine was left at the rear in the same way as the 7.5cm PaK40/2 auf Fgst PzKpfw II (Sf). The complete superstructure and engine cover were removed, and a new plate for the driver was fitted as part of the new self-propelled gun conversion. Photographic evidence also shows that some vehicles were fitted with the older 105.cm leFH16. Improvised self-propelled anti-tank guns using captured enemy tank chassis, were an attempt to make up for the lack of medium tanks and even the inferiority of some of their main guns, which were not powerful enough to knock out enemy tanks. Three German Army Abteilung (battalions) used this vehicle. On paper 12 was the correct strength per battalion. This howitzer saw operational service with the 1/155 Motorized Artillery Regiment, 21st Panzer Division; Sturmgeschutz Abteilung 200; and the 8th Panzerartillerie Abteilung. They were still in service during 1944 and saw action in Normandy. These vehicles were only used in the West. Sixty Hotchkiss H39 tank chassis were converted to mount 10,5cm leFh Howitzer guns by Baukommando Becker plus a further 60 were fitted with 7,5cm Pak. The German Army Sturmgeschuetz-Abteilung 200 consisted of 4 Batteries with 2 Platoons each, equipped with 2x 7,5cm Pak and 3 10,5cm leFh on Hotchkiss, plus an HQ-Section with one of each vehicles. So each Abteilung (battalion) were equipped with 24x 10,5cm leFh-18 auf GW Hotchkiss and 16x 7,5cm Pak Hotckiss (on paper). Other units would have a different configuration. The remaining vehicles were distributed among the units of 21st Panzer Division and other units in the Normandy (Abt. 643 France, abt.670 France, abt. 521 France). Some Hotchkiss 105mm SPG's used 10,5cm leFh-16 from WWI rather than the more modern 10,5cm leFh-18/40 howitzer gun. 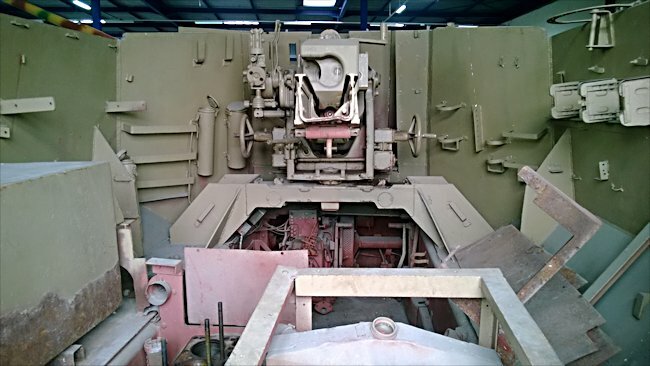 These machines can be identified easily because the WW1 gun does not have a the box housing around a top recuperator. The more modern gun has boxhousing above and below the gun. The self-propelled artillery guns fitted with the WW1 105mm Howitzer were called 10,5cm leFh-16 auf Geschutzwagen 39H(f). Alfred Becker was Commanding Officer of the German assault gun battalion Sturmgeschuetz-Abteilung 200, which was part of 21.Panzer Division, when the Allies landed in Normandy 6th June 1944. Prior to that date, Becker had under his command soldiers, engineers and mechanics that came to be known as the Baukcommando Becker (Becker’s Construction Command). The British and French Army tanks and vehicles still left in occupied France were mainly scrap, destroyed, blown apart and gutted. Becker was sent to France after he gave a presentation to Hitler in September 1942 on how artillery and anti-tank guns could be fitted onto captured French military Lorraine tractor units. His headquarters was in the Maisons-Laffitte, in a former French military camp. It was chosen because of its close proximity to the former Hotchkiss tank factory. Becker’s men collected a variety of vehicles from all over France: from ditches by the side of the road, rivers, hidden warehouses, the beaches near Dunkirk, French army camps and battlefields. Most of the time, there was nothing left but a bare skeleton chassis. They transported them to different factories and mechanical workshops. There, these vehicles were assessed, sorted and disassembled. One group of Becker’s men cleaned the parts, while others put the vehicles on an assembly line, where they were put back together, modifying them in the process. The completed vehicles looked like they were factory fresh. German Armored Fighting Vehicles that were captured enemy tanks were known as ‘Beutepanzer’, which, when translated, means ‘trophy tanks’. 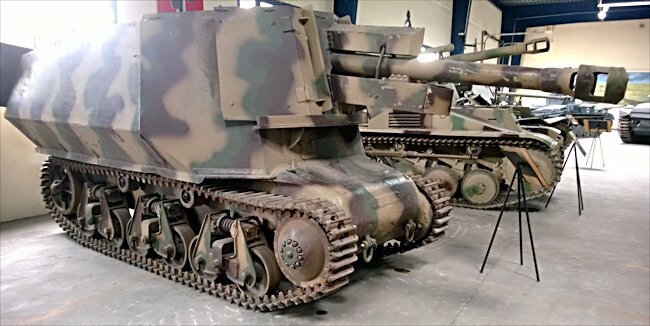 Captured tank chassis were converted into self-propelled artillery and anti-tank guns. 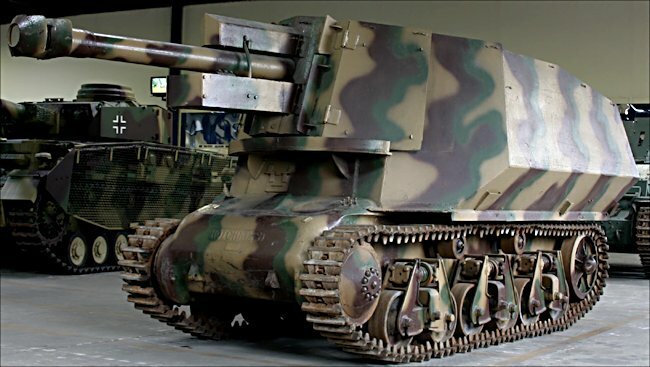 The Baukommando also produced self-propelled Nebelwerfer rocket firing artillery and troop transports from captured enemy vehicles. Initially, the completed vehicles were sent to the Eastern Front or to North Africa. Later, with the threat of an Allied invasion, they were deployed in France. This German Hotchkiss 10.5cm leFH 18 auf Geschutzwagen 38H (f) Self propelled Gun in the photograph below is now in a good running condition. It is in private ownership at the Association de Sauvegarde du Patrimoine Historique Militaire. 1 Rue Georges Cuvier, La Watzenau, France. The gun shield and armoured superstructure are reproduction but the chassis and gun are the real thing. Where can I see preserved Hotchkiss 105 mm SPGs?